Malcolm Martineau brings together some of the UK’s finest singers for the third release in his series charting the complete songs of Gabriel Fauré. In sixty years of songwriting, between 1861 and 1921, Fauré’s craft understandably developed in richness and subtlety. But many elements remained unchanged: among them, a distaste for pretentious pianism (‘Oh pianists, pianists, pianists, when will you consent to hold back your implacable virtuosity !!! !’ he wrote, to a pianist, in 1919) and a loving care for prosody—not infrequently he ‘improved’ on the poet for musical reasons. Above all, he remained his own man. Henri Duparc was a close friend, but his songs, dubbed by Fauré’s pupil Ravel ‘imperfect but works of genius’, had only a passing impact on Fauré’s own. Where Duparc embraces the grand gesture, Fauré for the most part prefers the suggestion, the nuance. In this respect, if in no other, his music resembles that of Erik Satie: it tends to speaks to each of us singly in familiar tones. Therefore recording is an ideal medium for it, free of all the material distractions of dress, gesture or facial exercise. Fauré’s preference for suggestion and nuance may seem to sit uneasily with his choice of Victor Hugo as the poet for his six earliest songs (one thinks of André Gide’s famous reply to question of who was France’s greatest poet: ‘Victor Hugo, hélas !’), but the composer, even at the age of sixteen, was careful over what he set. By 1861 he had been a pupil for seven years at the Ecole Niedermeyer in Paris which set out primarily to train church musicians. However, in that year Saint-Saëns joined the staff, bringing with him a a breath of modernist air nourished on such dangerous influences as Liszt and Wagner, and he and Fauré became lifelong friends. Not that the Hungarian or the German show up in these early Fauré songs. In 1865, possibly while still employed as an organist in Rennes, he reduced the 38 stanzas of Hugo’s ‘Tristesse d’Olympio’ to six, retaining the change of mood as the poet moves from a description of nature to speech. While the slow nature music sounds somewhat churchy, his more agitated complaint that Nature is deaf and blind to human sorrow leans towards Gounod, and the exact repetition of previous bars in the piano coda lacks the imaginative variation found in later songs. Fauré’s reduction of Hugo’s text to six stanzas does at least preserve a semblance of the message of the whole, but in Baudelaire’s ‘Chant d’automne’, one of the three settings he made of this poet in the years 1870 and 1871, his omission of the last two stanzas completely subverts the poet’s intentions: here, with his beloved’s help, the poet asks for the grace to enjoy autumn’s ‘gentle yellow sunshine’. Nonetheless, this is a powerful and beautiful song, in which the ‘choc funèbre’ of the falling logs is wonderfully transformed into the six pounding left hand octaves (Cs in this recording) to become a ‘choc monotone’, the slow last verse in the major mode giving an early taste of Fauré’s lyrical genius. The Parnassian poet Sully Prudhomme excelled as an observer of human emotions, especially what have been called ‘tristesses intimes’. ‘Ici-bas’, set by Fauré around 1873, can be read as either hopeful or dejected—are the dreams of constancy to be fulfilled or not? 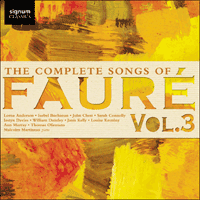 Fauré, having twice introduced the phrase ‘Je rêve’ with a gently surprising chord, sets the crucial ‘demeurent’ to a strong major one—but then he slips into the minor … We find a similarly ambiguous engagement with constancy in the same poet’s ‘Au bord de l’eau’, set by Fauré in August 1875. Even though the poet appears to be celebrating constancy, the litany of possible inconstancies—of water, clouds, smoke, perfume etc—seems to represent at least some sort of struggle against the status quo. Fauré’s gently rocking 6/8 rhythms speak of constancy, but his harmonies, magical as they are, are not wholly restful—note especially the sudden unexpected note on the second syllable of ‘amour’, and perhaps the even more unexpected one on ‘tout’, which threaten to derail the flow. If Fauré’s experiences in the Franco-Prussian War left him with a horror of violence in all its forms, the abandoned engagement with Marianne Viardot left scars of another sort, no less wounding. The Ancient Greeks were alive, as their tragedies tell us, to the notion of ‘pathei mathos’, ‘learning through suffering’, and many of Fauré’s songs from the late 1870s on testify to the truth of this idea. ‘Automne’, from 1878, is among the most moving of these. The opening bars are both majestic and sinister, the RH triplets, unchanged for nine bars, being invaded by the widespread, chromatic LH octaves, while the voice intones two almost-identical phrases: the effect is one of operatic tempo and gravity, as autumn provokes the poet’s bitter regrets for his distant youth, culminating in the singer’s highest note on ‘oubliées’. In Fauré’s second setting of Verlaine, ‘Spleen’, from 1888, the piano abandons melody for patterns of raindrops, picturing Verlaine and his lover Rimbaud holed up in their cheap London lodgings on the site of what is now the Post Office Tower. The rhythm of the rain may vary between duplets and triplets, but the harmonies rarely stray far from the tonic D minor. Boring? Not for a second, since Fauré’s genius for momentary modulation can surprise even within such narrow limits, aided by the occasional rhythmic surprise, such as the curious placing of ‘sur les toits’, the voice’s contribution to the rain’s tapping. A similar intensity marks the song ‘Soir’ of three years earlier. The magic of evening has appealed to many French poets and composers over the years, but few have equalled Fauré in combining relaxation with interest, ennui with loving attention. The first verse hovers round the tonic and ends there; the second verse reacts to the poet’s commands with modulations that seem to depict ‘le goût secret des pleurs’; in the third verse, the thinning of the piano texture (right hand alone) leaves room for the left to enter exactly as pity places its ‘finger on us’. Before finally composing an opera (Pénélope, premiered in 1913) Fauré prepared himself by writing occasional pieces of incidental music. For a performance of Molière’s Le bourgeois gentilhomme in 1893, he wrote a serenade for the famous music lesson in Act I, though apparently it was not used. The gentilhomme, Monsieur Jourdain, pronounces the serenade ‘lugubre’ and, as Graham Johnson points out, ‘Fauré makes sure it is anything but in order to emphasise Jourdain’s pretentiousness and inability to appraise music’. Five years later he wrote music for a performance in London of Maeterlinck’s Pelléas et Mélisande, including a song, ‘The King’s three blind daughters’, for Mélisande. As befits her quiet, self-effacing character, the music is spare but deeply affecting, and Fauré later borrowed it to begin the cycle La chanson d’Eve. When he became director of the Paris Conservatoire in 1905, he took a particular interest in the teaching of singing, banning familiar pieces by well-known composers as ‘arranged by Monsieur X’. The two Vocalises on this disc, of 1906 and 1916, as well as the Vocalise-Etude of 1906, show what he was looking for in the accomplished singer: clear articulation, agility and a smooth delivery—the Vocalise-Etude bears the firm command ‘Legato sempre’, and the demi-semiquaver scale near the end must be ‘Espress[ivo]’. In the period between 1910 and his death in 1924 Fauré abandoned single songs in favour of four song cycles—perhaps writing Pénélope gave him a taste for larger canvases? Mirages, the third of these, shows what simplicity can achieve in the right hands. Fauré forgoes even the basic attractions of tempo variation: the pulses of the four songs lie merely between crotchet=60 and crotchet=66. As for intervals in the vocal line, there is one octave, one sixth, and all the rest are fifths or less, with a preponderance of conjunct movement, probably going back to the plainsong that had formed a large part of his education. But in this narrow field, what power comes from small things: the upward chromaticism launched by ‘et des blancs nénuphars’, the sudden appearance of 19 repeated Es in the third song, the dancing dotted rhythms of the last one! Herein lies the wisdom of a lifetime.